Bundesliga | Borussia Dortmund vs. RB Leipzig: Who wins and why? Borussia Dortmund vs. RB Leipzig: Who wins and why? Dortmund are off to their best ever start in the Bundesliga, with an impressive total of 19 points from seven games and an astonishing goal difference of +19. New coach Bosz has hit the ground sprinting, let alone running, and his resolutely attacking 4-3-3 appears tailor-made for the wealth of talent at his disposal. His side have scored 13 goals in just three Bundesliga home outings this term, and remain unbeaten at the Signal Iduna Park in 41 league games. Leipzig haven't quite found the consistency that saw them kick off their maiden top-flight campaign with a 13-game unbeaten run, but they seem to be heading in the right direction after back-to-back wins over Eintracht Frankfurt and Cologne. Last season's runners-up are currently six points adrift of Dortmund in fourth place, and won't want to be left behind in the 2017/18 title race, which is shaping up to be more open than it has been for many a Bayern Munich-dominated season. Both sides claimed narrow 1-0 victories in keenly-contested encounters last term. So where could the tactical battle be won and lost on Saturday? Dortmund have laid the foundations for an excellent start to the campaign with some rock-solid defending, conceding just two goals in seven Bundesliga outings. Bosz appears to be a fan of the old adage that attack wins you games and defence wins you titles, and he has made sure that all of his players - even the forward-thinking ones - do not shirk their defensive responsibilities. It should come as no surprise, given that his Ajax side had the joint-best defence in the Dutch Eredivisie last season, letting in only 23 goals in 34 matches. Greek defender Sokratis remains the beating heart of the Dortmund backline, having featured in all seven games so far and helped his side keep clean sheets in their first five encounters. The BVB captain has won 63 per cent of his challenges and boasts an average of 115 touches a game, which shows how important Bosz considers it to build play from the back. With Roman Bürki and Marc Bartra also on top form, Leipzig will have two kinds of Yellow Wall to contend with at the Signal Iduna Park on Saturday - one in the stands and one on the pitch. The visitors have only managed to keep a single clean sheet this term, shipping eight goals in seven games. It hasn't helped that captain Willi Orban was missing for two games, while his 18-year-old central defensive partner Dayot Upamecano is still adapting to the rigorous demands of Bundesliga football. Hasenhüttl will be particularly wary of conceding the opening goal on Saturday, seeing as his men have lost two of the three games in which they fell behind, to Schalke and Augsburg. Dortmund's high pressing game will also make life difficult for Leipzig's backline and defensive midfielders, who will have to be on top of their game physically, mentally and technically to prevent the hosts from enjoying another free-scoring evening in front of their fans. The only good news for the visitors? BVB right-back Lukasz Piszczek is out after picking up a knee injury playing for Poland. As is so often the case, the midfield battle may well hold the key to the outcome of this game - and considering that so little separated these sides in 2016/17, it seems unlikely that Dortmund will claim a third straight home win by a five-goal margin, after running riot against Cologne and Borussia Mönchengladbach. Leipzig favour a 4-4-2 with two defensive midfielders and two wide men, but they risk leaving themselves exposed down the middle against Dortmund's central trio, which could be made up of any combination of Julian Weigl, Gonzalo Castro, Shinji Kagawa and Mario Götze - all players with outstanding technical ability and an eye for a killer pass. Emil Forsberg and Marcel Sabitzer are likely to drift in from the wings to stop Dortmund finding a way through. Hasenhüttl's men have some pretty handy central midfielders of their own, though, starting with the returning Naby Keita. The future Liverpool man will be champing at the bit to get back on the pitch after serving a three-game suspension, and he'll have fond memories of facing Dortmund - it was his 89th-minute strike that handed Leipzig a historic first Bundesliga win at the expense of their illustrious opponents on Matchday 2 last season. Keita certainly isn't afraid to come forward with the ball, having already attempted 49 dribbles in just four league outings. Another goal from their midfield maestro could tip the scales in Leipzig's favour - they have won all seven previous Bundesliga games in which he has scored. And nobody will need reminding about Forsberg's creative abilities, after he laid on 19 assists last season. Dortmund, meanwhile, can call on the formidable talent of Christian Pulisic as they attempt to pick holes in the Leipzig defence. After the crushing disappointment of failing to qualify for the 2018 FIFA World Cup, the USMNT star will be looking to bounce back with Dortmund and add to his two goals and one assist from earlier in the campaign. Whichever players Bosz and Hasenhüttl choose to start, there should be a terrific melee in midfield - and don't be surprised if the team that successfully controls the heart of the Signal Iduna Park pitch ends up with three more points in the bag. Pierre-Emerick Aubameyang's blistering start to 2017/18 is one of the other reasons why Dortmund are currently sitting pretty at the top of the Bundesliga. The Gabon captain has already netted 13 goals in all competition - including eight in the league - and looks determined to win a second consecutive Torjägerkanone after finishing last season as the division's top scorer. Aubameyang got the goal that gave BVB a measure of revenge over Leipzig in February's 1-0 win at the Signal Iduna Park, and he will now be hoping to pull clear of his perennial rival Robert Lewandowski in the current season's scoring charts - the Bayern frontman has also notched up eight goals after seven games. Leipzig will be frantically hoping that Timo Werner recovers in time to face Dortmund, having missed the last three outings for club and country with a neck injury. The Germany forward returned to training on Tuesday, but may be lacking sufficient match fitness to start on Saturday evening - or to threaten BVB's imperturbable backline. Then again, the 21-year-old has been upsetting the odds ever since he burst onto the scene a year ago, to the extent that he already looks assured a place in Joachim Löw's 23-man squad for next summer's World Cup, where places will be at a serious premium. Last season's top-scoring German in the Bundesliga with 21 goals, he is already up to five in six appearances this term. Werner tends to cover more ground than Aubameyang - over 11 kilometres per game, compared to just under nine for the Dortmund striker - and he has a similarly frightening turn of pace, clocking a top speed of 35 kilometres an hour earlier in the season. Clearly, both sides have other tricks up their sleeves going forward. Maximilian Philipp has settled in very nicely at Signal Iduna Park since his summer transfer from Freiburg - scoring braces in his last two home outings - while Andrey Yarmolenko opened his Bundesliga account with a cheeky backheel against Augsburg on Matchday 7. Meanwhile, Leipzig look to have done a shrewd bit of business in snapping up Jean-Kevin Augustin from Paris Saint-Germain - the 20-year-old French forward has already grabbed two goals and two assists in his first five league appearances. Yet Aubameyang - and, if he features, Werner - will inevitably be out to hog the limelight, and the rewards could be considerable. Dortmund have an opportunity to pull nine points clear of a potential title rival, while Leipzig could get themselves right back in the mix. When the clock strikes 18:30 CEST on Saturday make sure you're near a television - because this one is not to be missed. 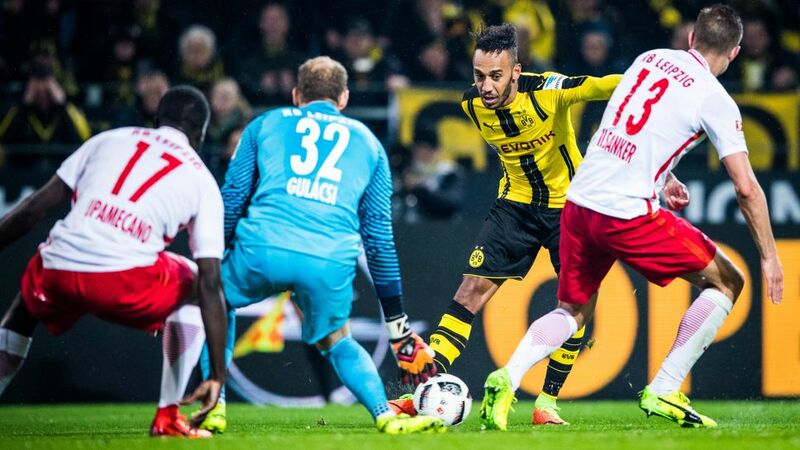 Click here for the Dortmund vs. Leipzig Match Centre!